Maintaining the shape and size of your trees is essential when it comes to creating a healthy, aesthetically beautiful garden space. There’s no one size fits all solution which is we use a wide range of pruning, reduction, lifting and thinning techniques to create the perfect look for your garden. It’s not just the trees themselves that can benefit from crown lifting, crown reduction and pruning. A more open area in and around your trees can promote healthy wildlife as well as the growth of other plants and shrubs. There’s also the added benefit of protecting surrounding property such as houses, sheds and fencing by maintaining your trees throughout the year, helping to avoid falling branches and other natural hazards. Tree pruning is a common technique used to remove diseased wood and dead twigs from your trees. It’s a great way to limit the spread of disease to other areas of your tree as well as offering a low impact way of shaping and thinning the internal canopy. Avoid issues for your trees later down the line by introducing formative pruning to encourage a healthy, natural shape as they mature. It can also help your trees to avoid structural issues or defects which can become costly as they get older. Crown reduction can help to balance the height and width of your tree without impacting on its health. It’s perfect for trees which have become overgrown and or need a gentle trim to restore their shape. If a tree’s crown is cluttered and dense, it can have a negative affect on the flow of air and light. Crown thinning reduces the crown’s density, ultimately helping your trees to live longer, healthier lives. If you’re looking to increase the height of your tree’s crown to open up its lower areas then crown lifting is a great solution. It can help to increase the light that reaches the wider garden and flower beds below, as well as improving sight lines and the overall beauty of your space. Deadwood in trees can not only be a real eyesore, but can also allow disease to fester and branches to rot. This can quickly become a very dangerous hazard and could lead to more severe corrective measures further down the line. We’ll quickly and effectively remove this deadwood to increase the longevity of your trees and keep your garden looking fresh all year round. 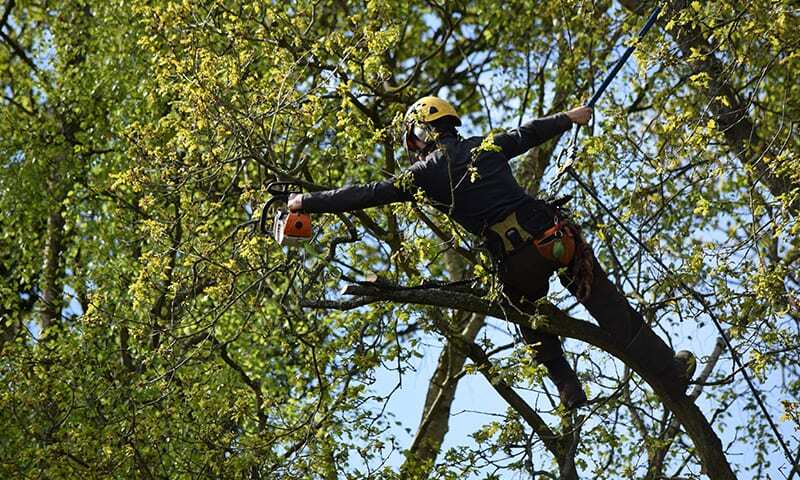 Remember, all of our South London tree surgeons are NPTC qualified, plus every project is covered with a minimum of £5m public liability and employee liability insurance throughout. If you’ve got any questions regarding our tree pruning and crown reduction services, or would like a free no obligation consultation, Contact Us today and a member of the team will be in touch at a time that’s convenient to you.